On May 16, 2017 Troy City School District residents approved a $112 million budget for the 2017-18 school year as well as a proposition to establish a Capital Reserve Fund. In addition three incumbent candidates have been re-elected to the Board of Education: Carol Harvin, Tom Mayo and Bill Strang. Learn more. The official results of the budget vote are 532 (yes) to 133 (no). 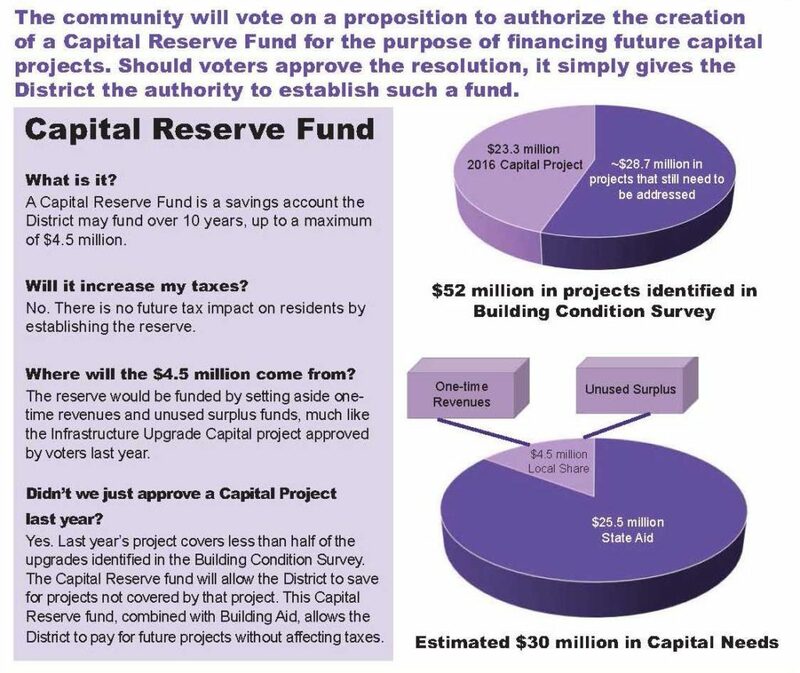 The official results of the Capital Reserve Fund Proposition vote are 533 (yes) to 117(no). The official results of the Board of Education election are Carol Harvin (524), Tom Mayo (516) and Bill Strang (520). Call 328-5070 if you have questions about your polling location. 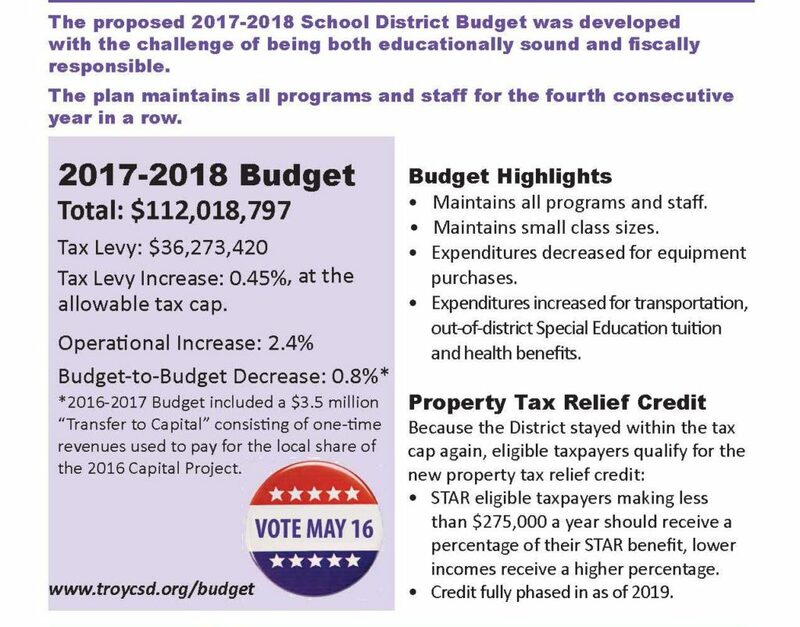 On Wednesday, April 12, the Troy City School District Board of Education unanimously adopted the proposed 2017-2018 budget of $112,018,797. The tax levy will be $36,273,420, representing a 0.45-percent tax levy increase, which is at the allowable tax cap. Learn more. On May 16, 2017 the Troy City School District community will vote on a proposition to authorize the creation of a Capital Reserve Fund for the purpose of financing future capital projects. This item will be included on the ballot along with the proposed 2017-2018 budget and Board of Education election. Learn more. March 23, 2017 – During the March 22 Board of Education meeting, Superintendent John Carmello presented the second draft of the 2017-2018 School District Budget. The proposed draft of $113,040,797 will come with a tax cap of .45%, less than half a percent increase from last year. Carmello also proposed that the Board vote to approve a resolution on the May ballot that, if approved by voters, would authorize the District to establish a Capital Reserve to save for future projects. There is no tax implication to establish such a reserve. Learn more. February 16, 2017 – During the February 15 Board of Education meeting, Superintendent John Carmello outlined the first draft of the 2017-2018 school district budget. The proposed budget, still very much in its early phases, totals $112,909,509, a 3.82-percent total increase over the 2016-2017 budget. Carmello discussed some of the challenges facing this year’s budget including a .45% tax cap and initial state aid figures. Learn more. School 2 PTO, 4 p.m.
Carroll Hill School PTO, 6 p.m.
School 16 PTA, 7 p.m.
School 18 PTA, 7 p.m. Poll Hours 7:30 a.m. – 8 p.m.